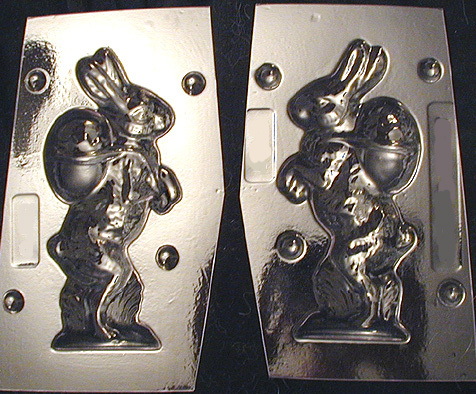 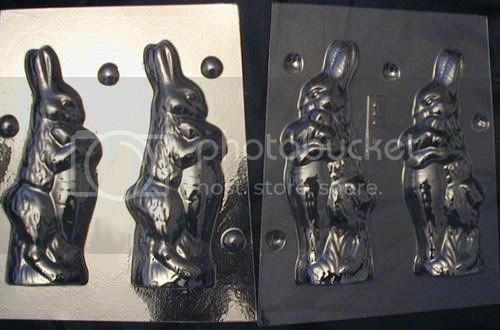 The Chocolate Molds are double sided plastic chocolate molds and make a 3D figure, unless otherwise described. 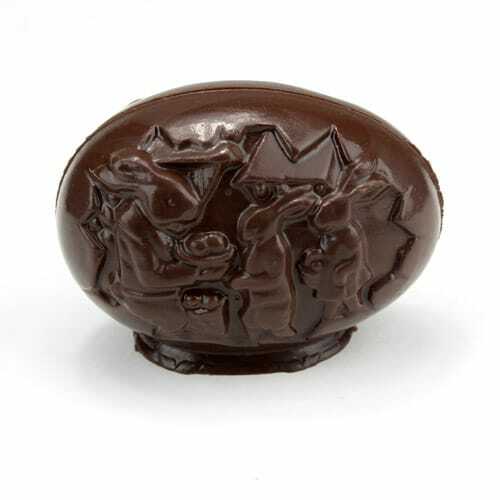 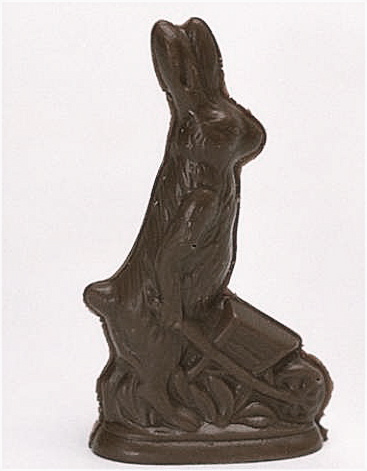 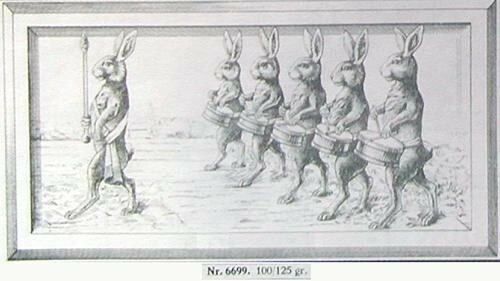 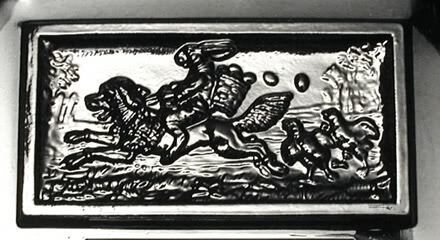 Most of the chocolate molds are reproductions of very rare Anton Reiche chocolate molds with excellent detail. 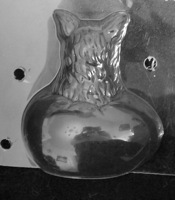 The size indicated refers to the finished piece crafted from the mold. 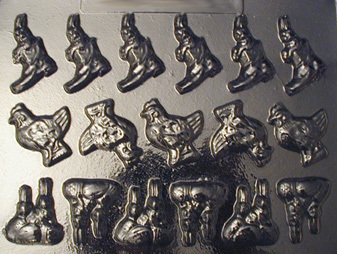 All chocolate molds are brand new, FDA approved and safe for making chocolates. 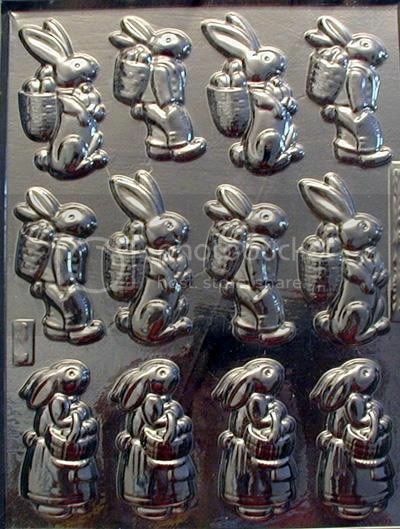 These chocolate molds are perfect for chalkware (plaster of paris), beeswax and paper mache. 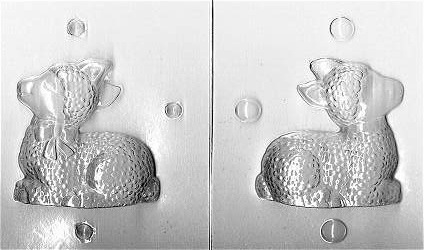 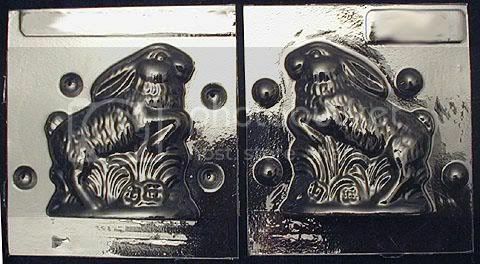 During the switch over to heavy grade/confectionery quality plastic, some molds are still hobby grade plastic unless it is marked "heavy duty plastic". 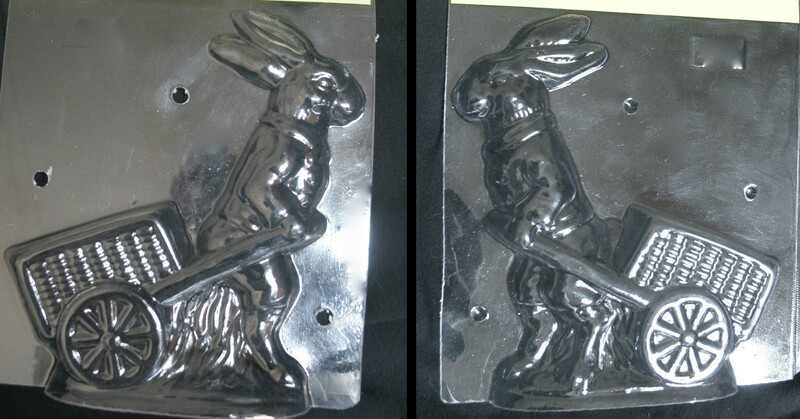 The Heavy Duty plastic molds will be open bottom molds unless you specifically request closed bottom special order. 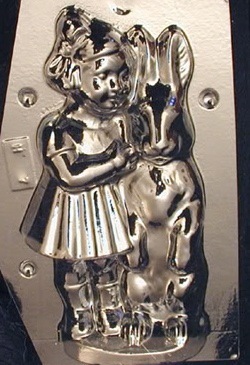 Please email requests to kathyc828@aol.com to confirm your order. 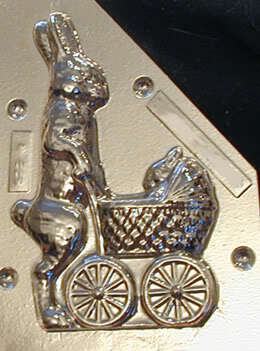 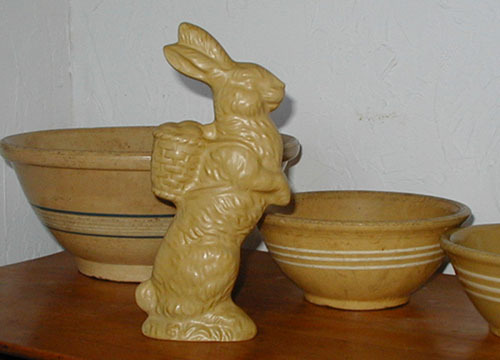 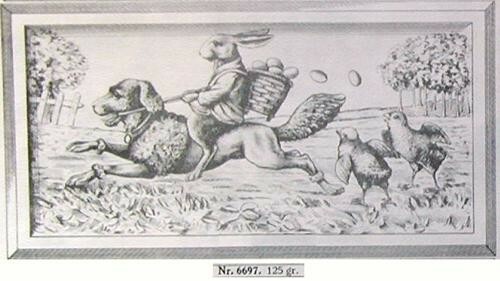 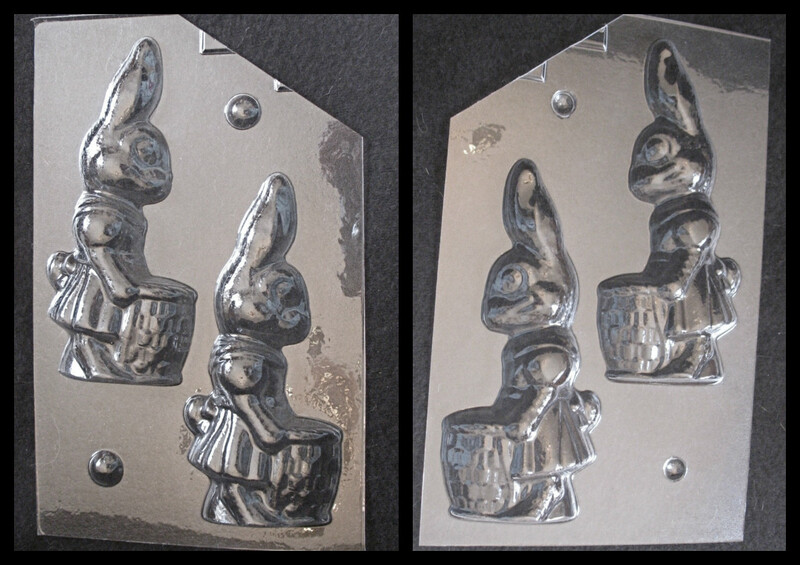 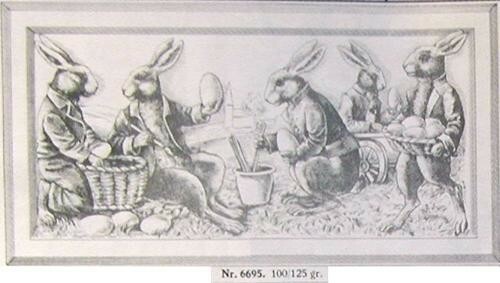 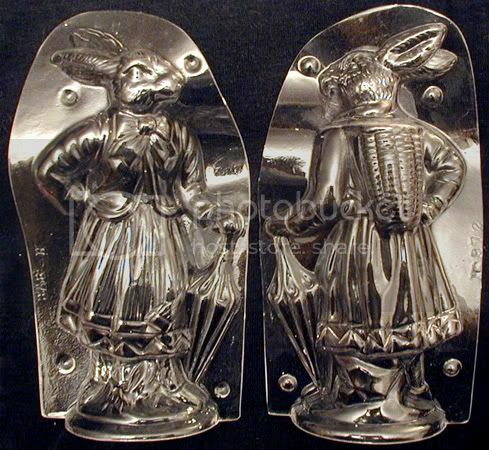 #E103, Rabbit & cart, 4.6"
#E513; Rabbit on Mushroom, 7 1/2"
#E195; Girl & Bunny, 7"
Single Sided Plastic Postcard Chocolate Molds. 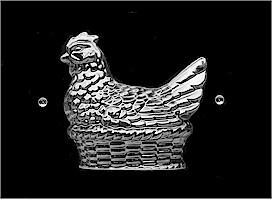 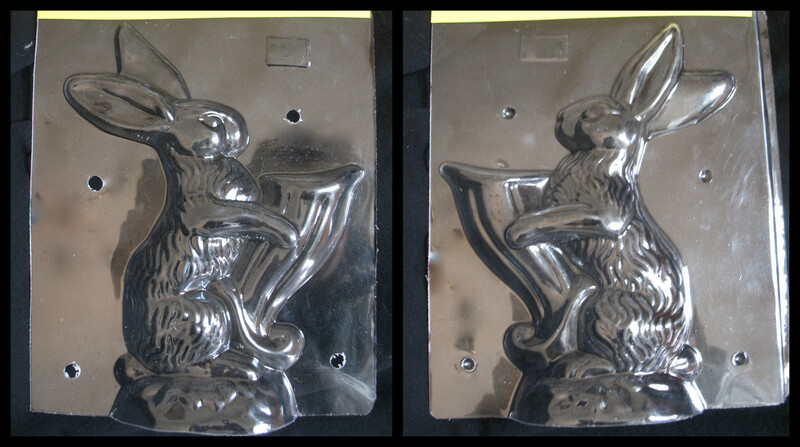 6 1/8" & 6 5/8"
#E144; Rooster and Chick Cart 3 3/4"
Single Sided Plastic Chocolate Molds. 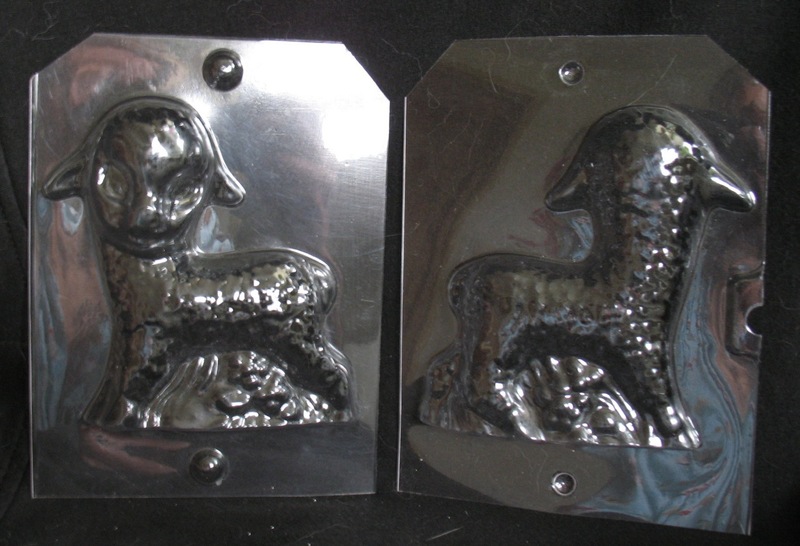 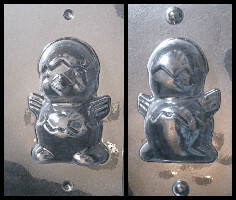 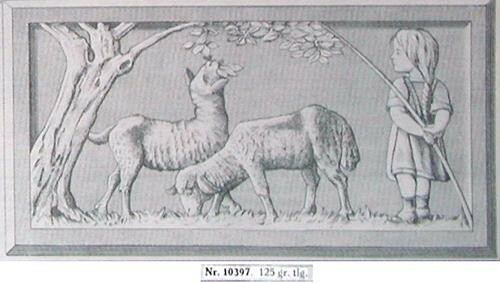 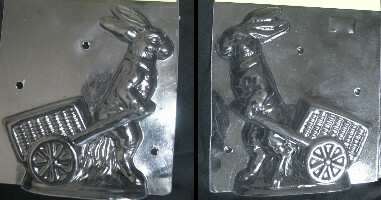 The molds shown below are reproductions of rare Anton Reiche (Dresden, Germany) antique chocolate molds. 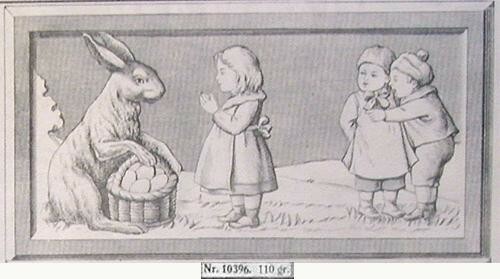 Photos are from an antique Anton Reiche Chocolate Mold catalog. 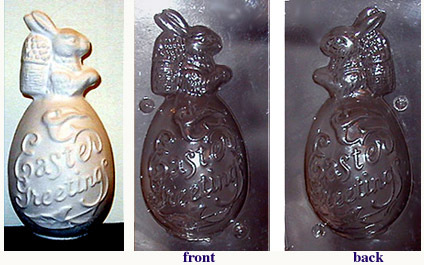 Click Image for photo of Actual Mold. 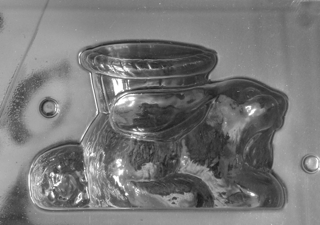 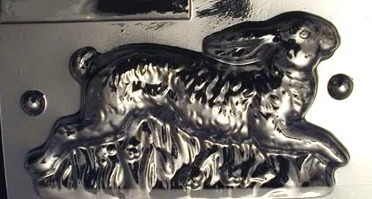 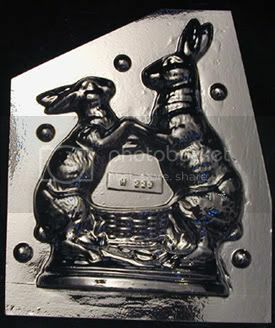 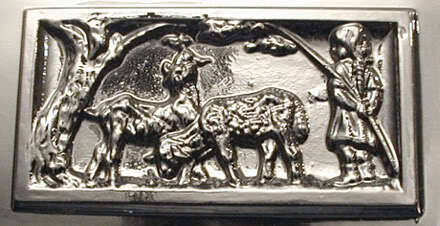 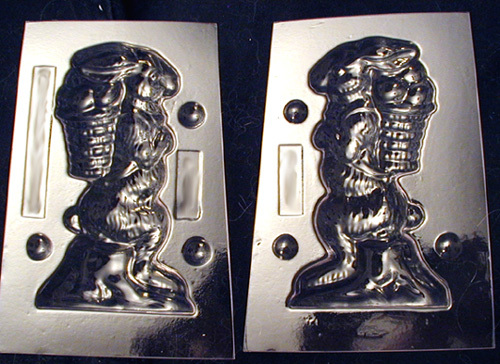 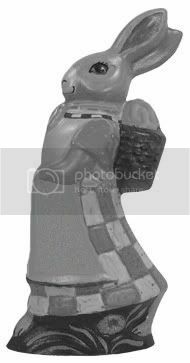 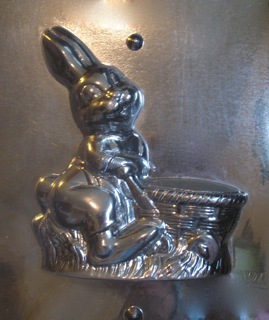 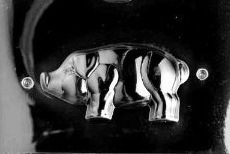 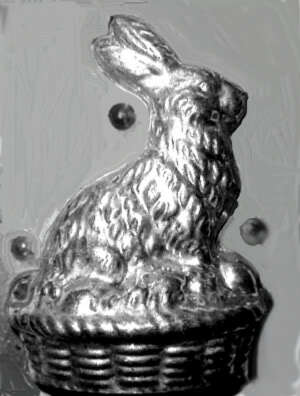 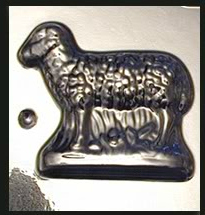 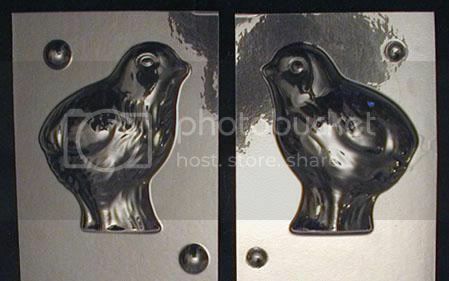 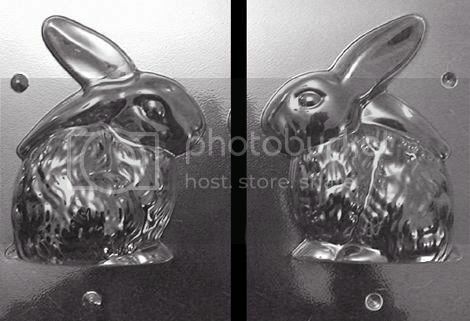 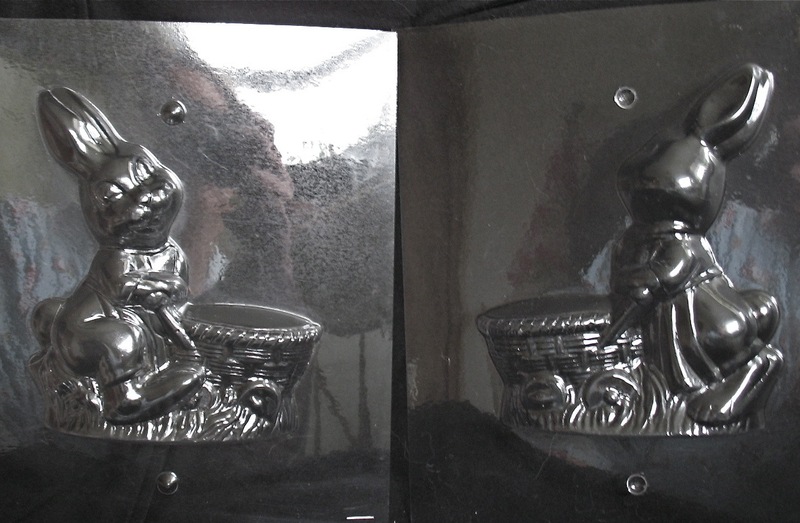 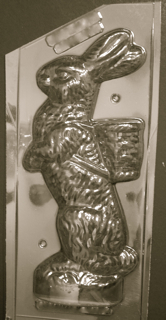 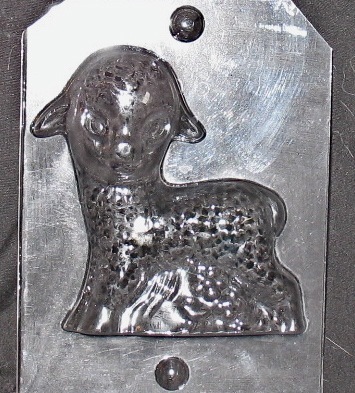 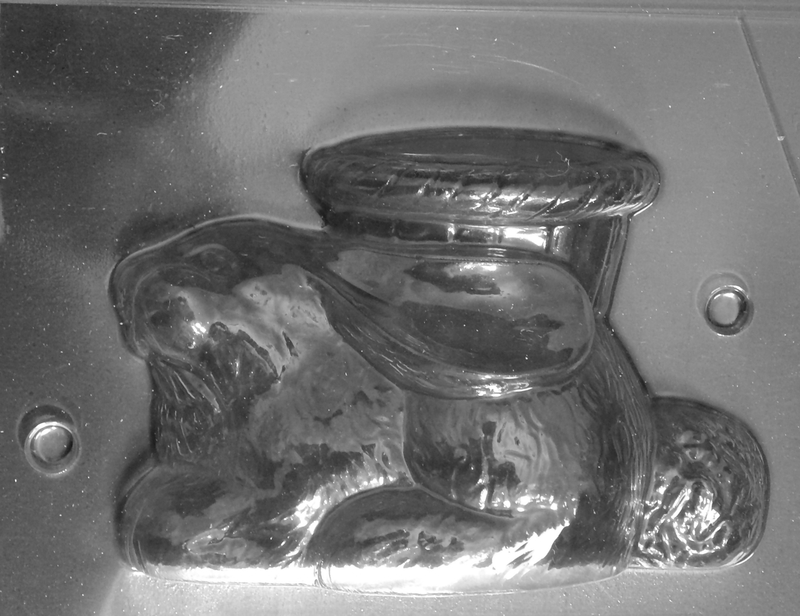 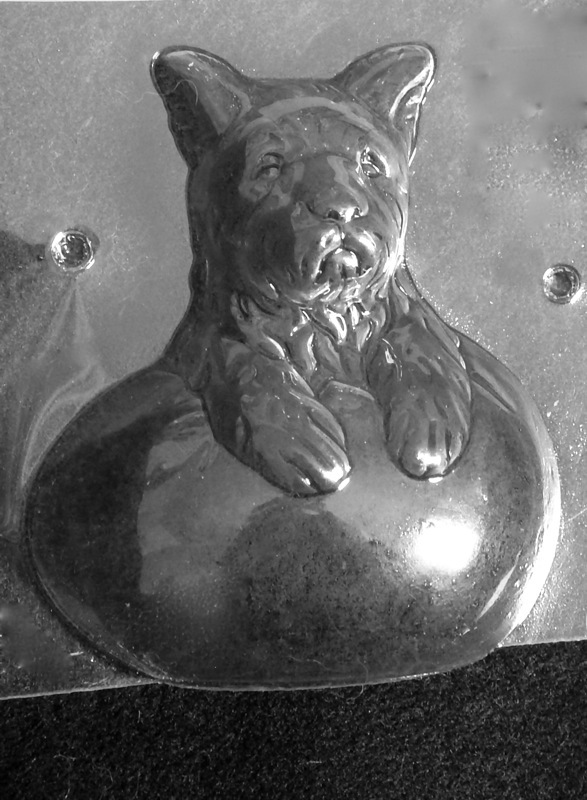 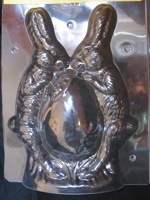 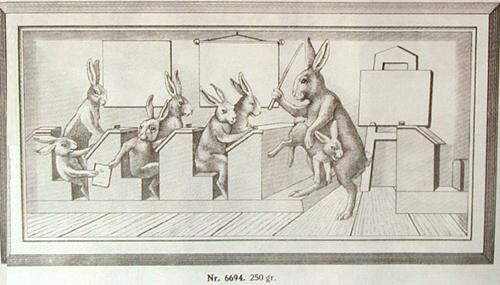 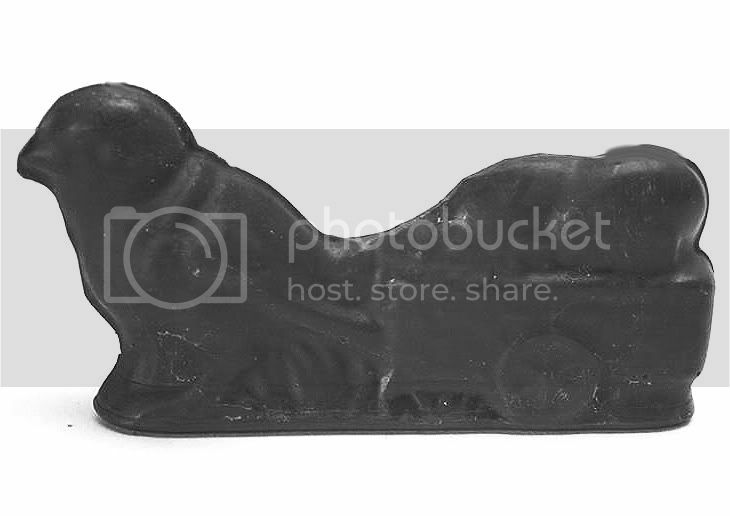 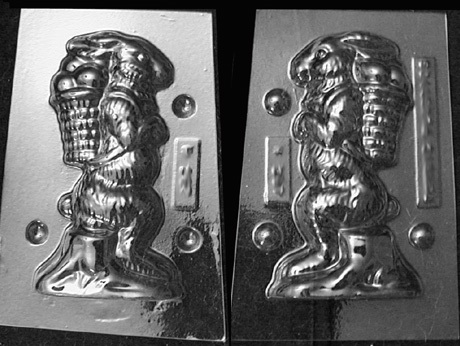 Click Image for photo of Actual chocolate Mold.
. 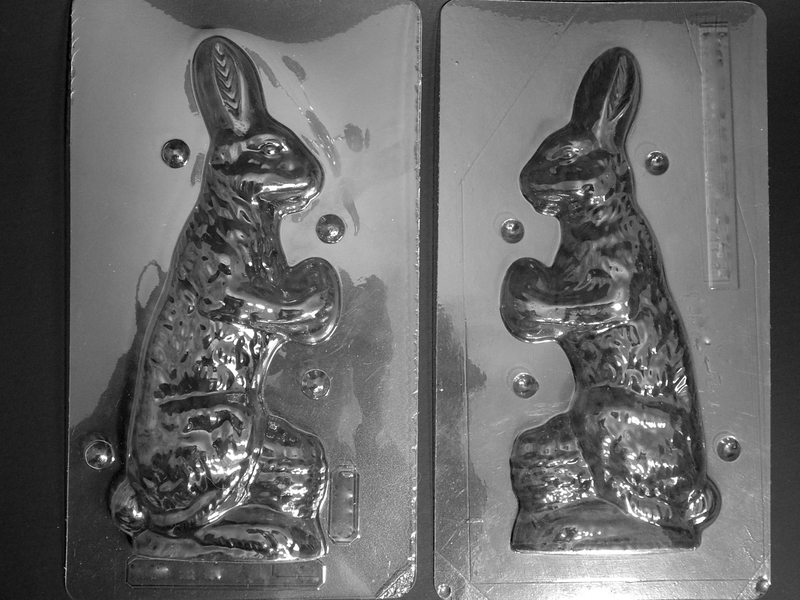 Please contact me at kathyc828@aol.com to place an order for plastic chocolate Molds, answer any questions,or if you'd like more information about any of the molds. 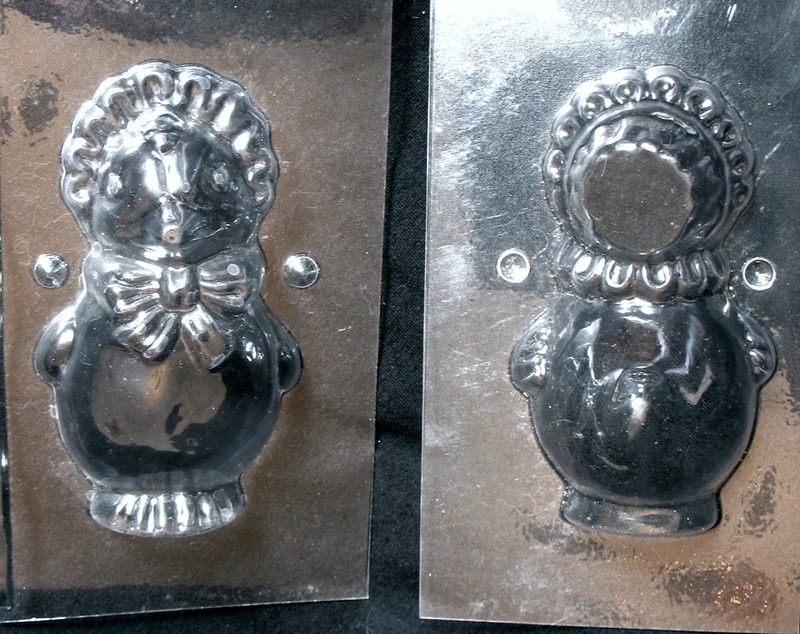 We offer a large selection of plastic chocolate molds that are a reproduction of very rare, vintage and antique metal tin German chocolate molds made by manufacturers including Anton Reiche, Heris, and Walter in Germany; Letang in France and Eppelsheimer in the USA. 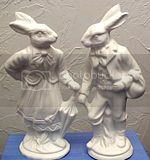 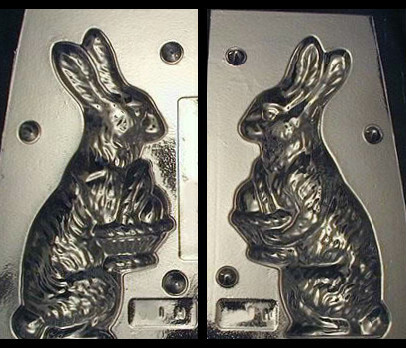 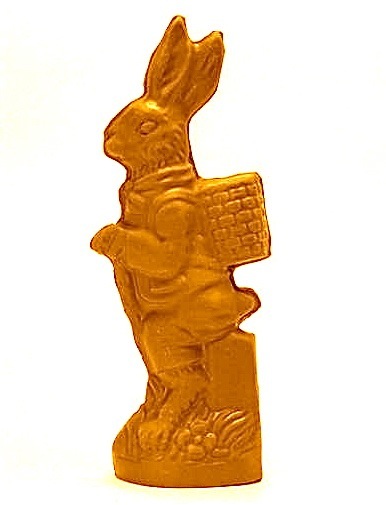 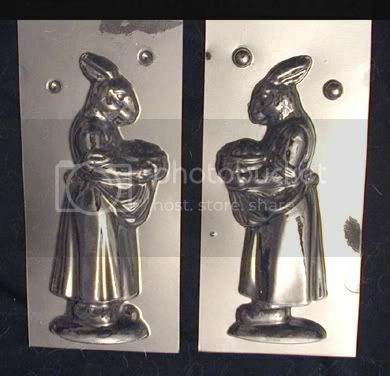 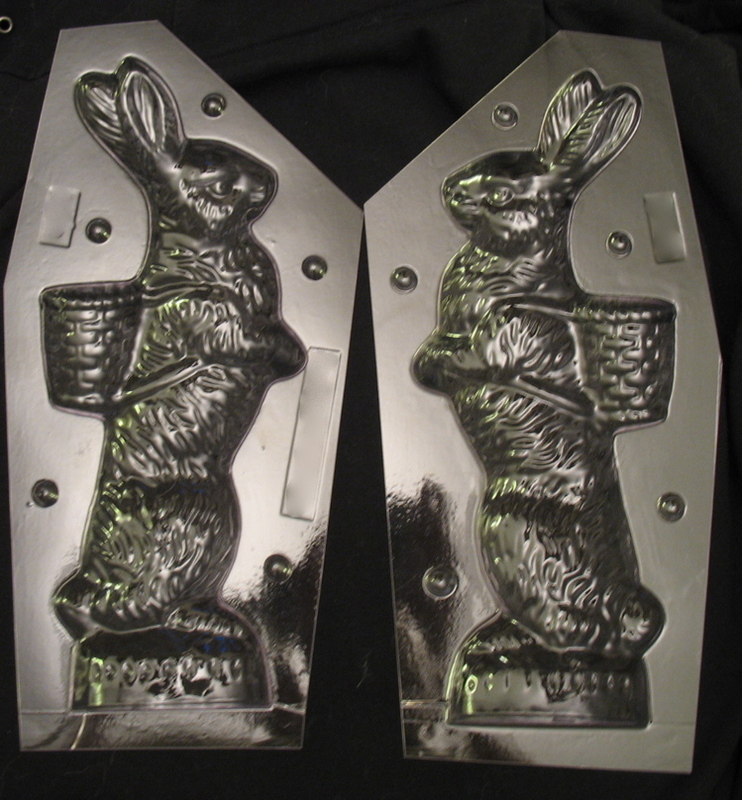 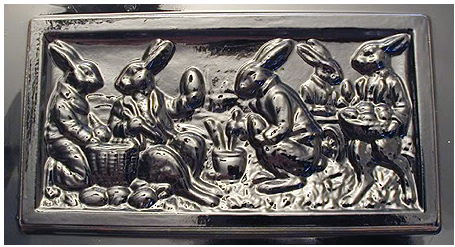 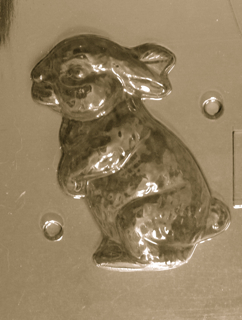 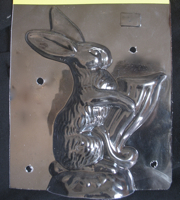 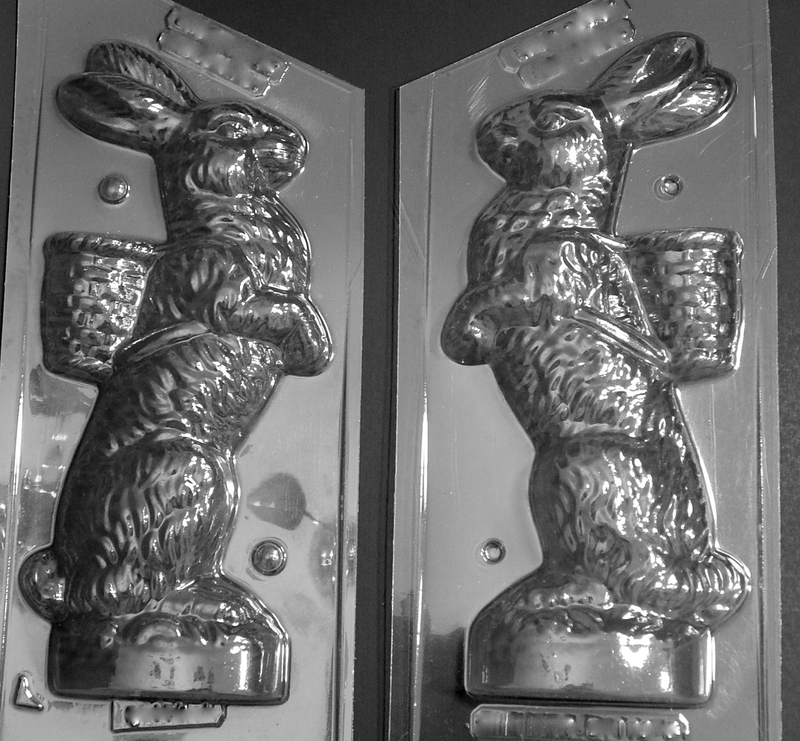 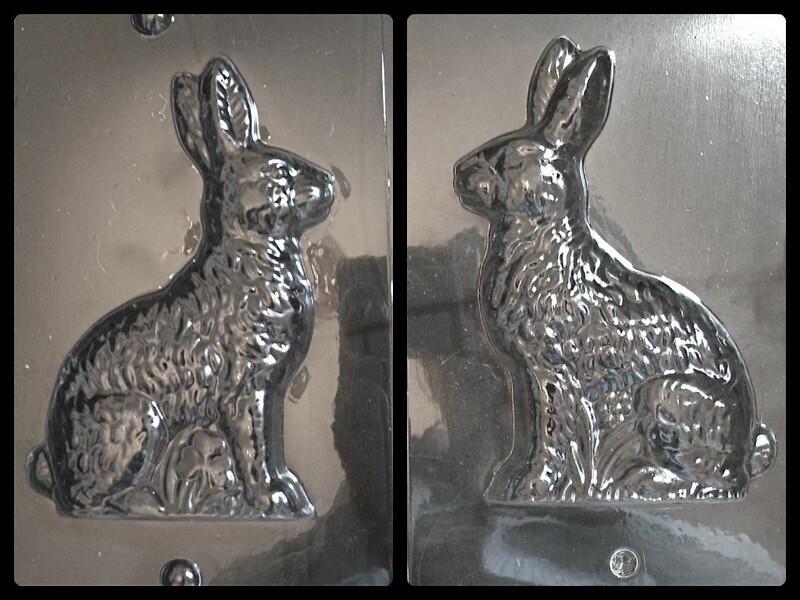 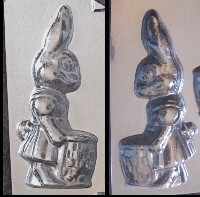 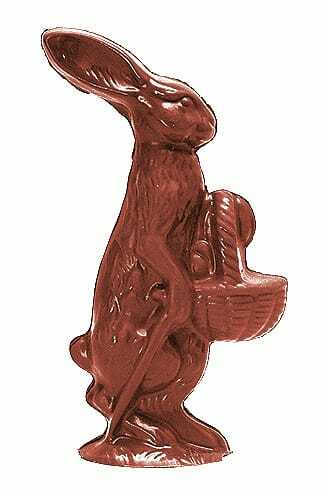 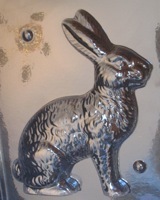 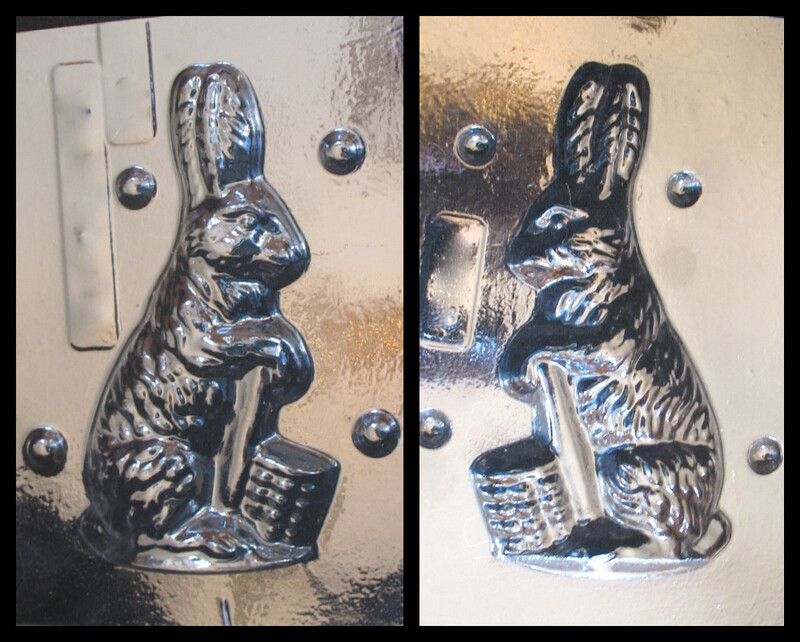 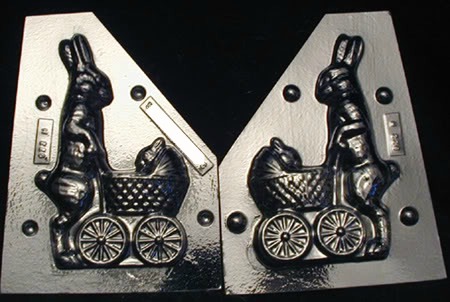 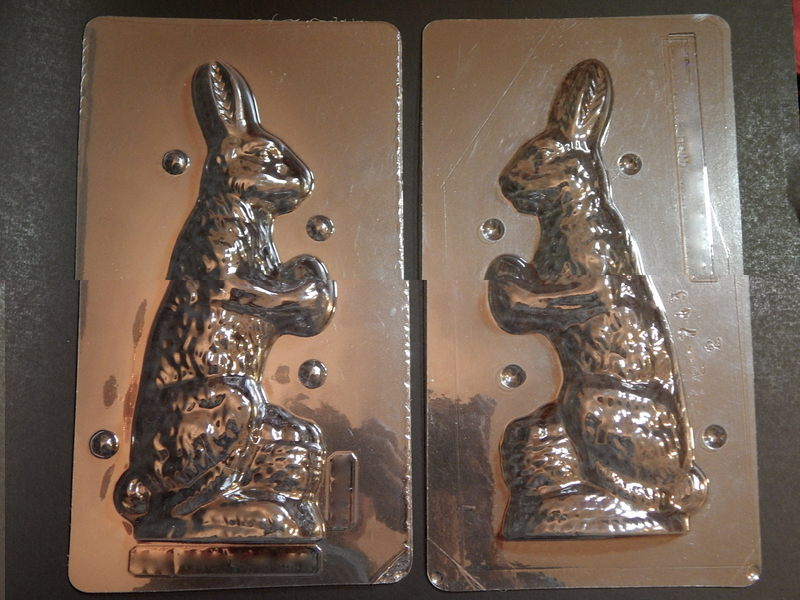 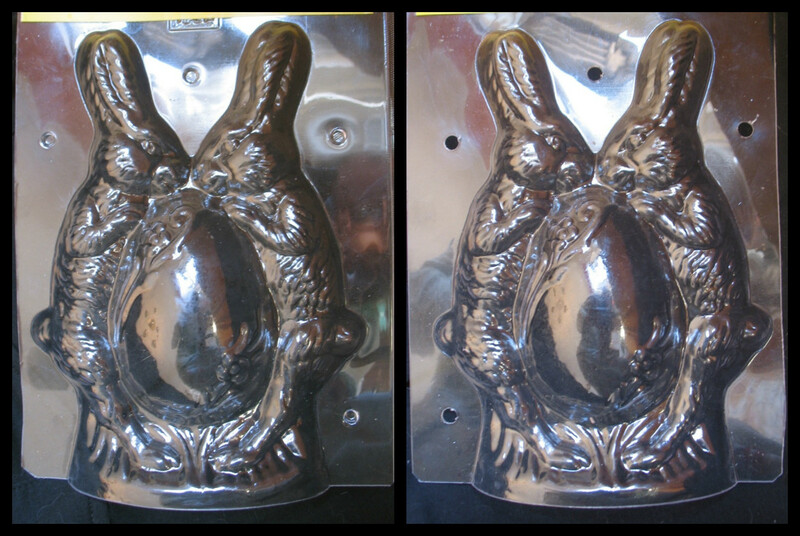 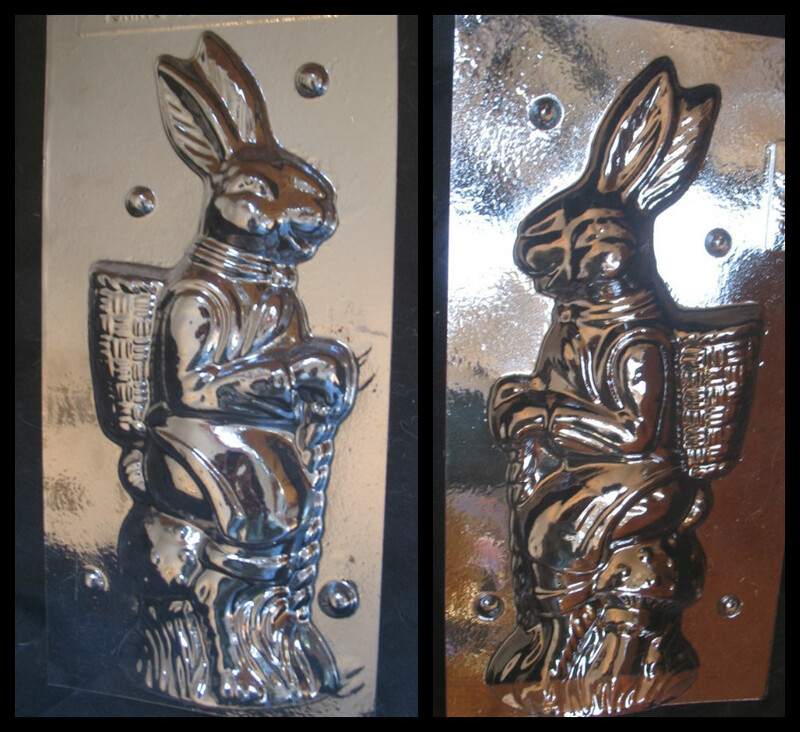 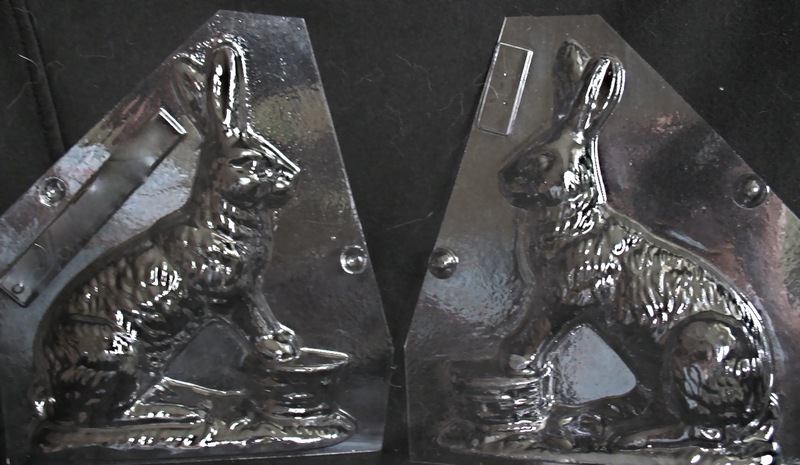 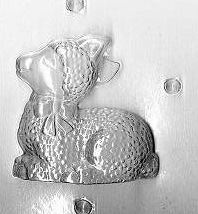 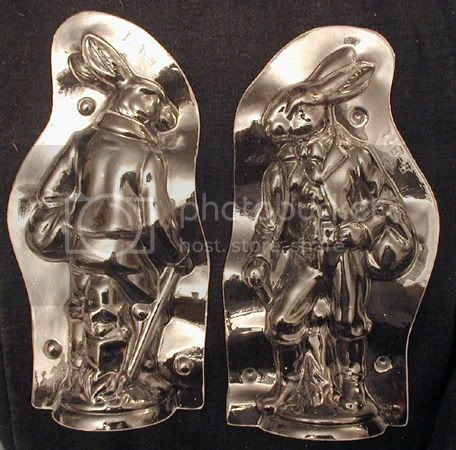 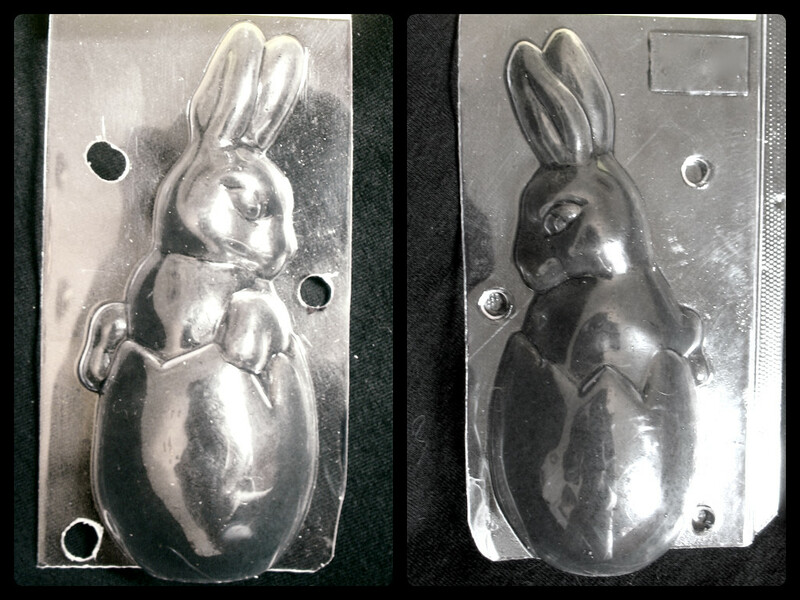 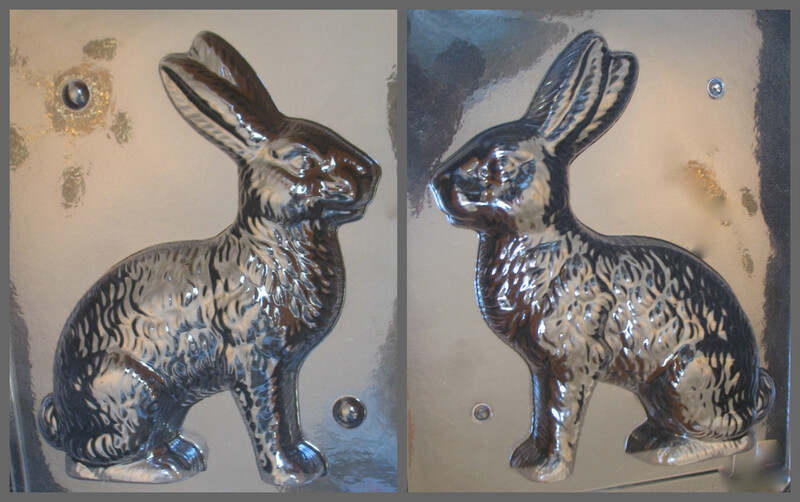 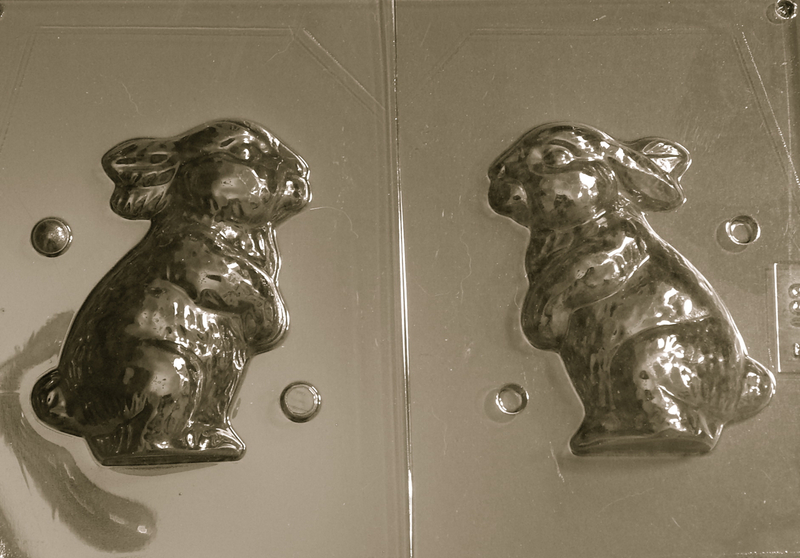 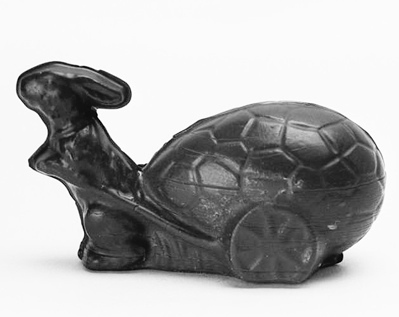 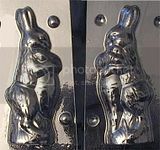 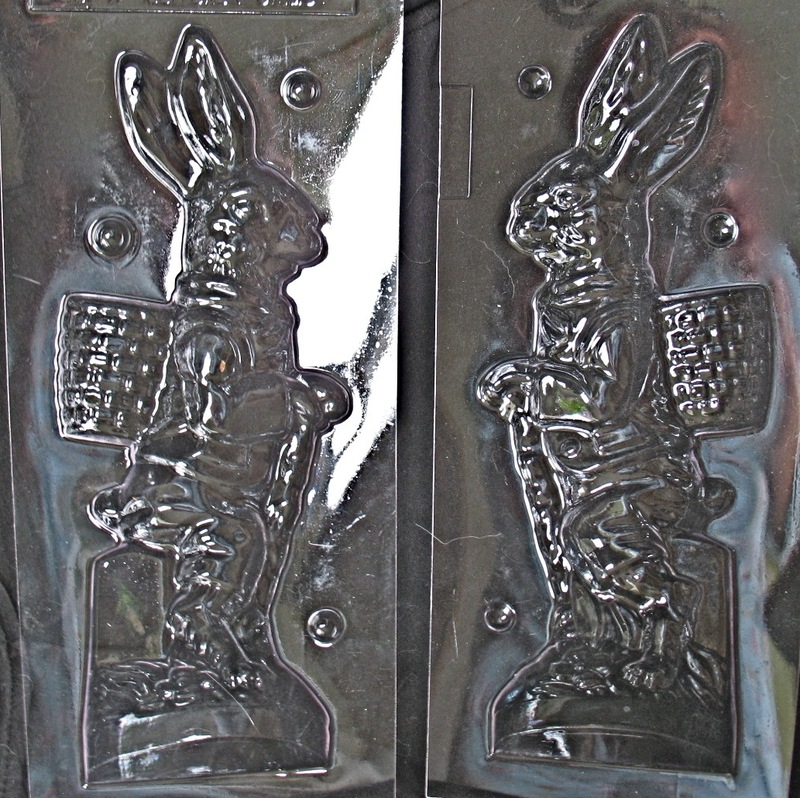 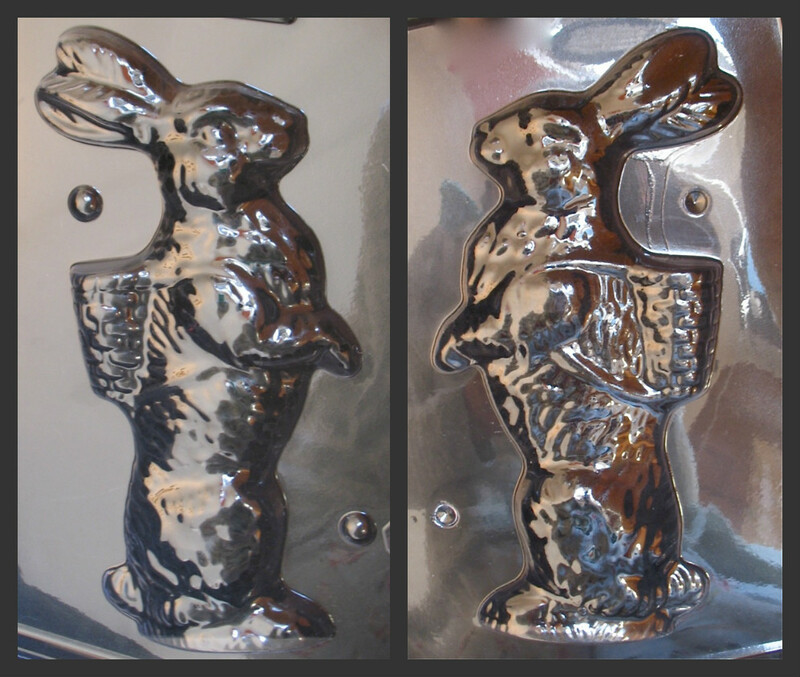 Plastic chocolate molds based on these wonderful antique chocolate molds are wonderful to use for making your own paper mache, papier mache easter rabbits, Santas, lambs and paper mache candy containers.